It's a dark and stormy night. You flick on the hall light, plug in the coffee maker and crank up the portable electric heater. You're starting to feel comfy, when you hear a faint, yet ominous, click—and everything goes black. It's not a cat burglar or a poltergeist playing tricks with your electrical system. It's an overloaded circuit being protected by a tripped circuit breaker. Kinda spooky and mysterious, eh? Not if you know a few simple things. When electricity enters your home, it goes to a circuit breaker box (or fuse box in older homes), where it's divided into a number of circuits. Each circuit is protected by a breaker or fuse. Bedrooms, living rooms and family rooms where only lights, alarm clocks and other small electrical items are usually used are normally on 15-amp circuits. Kitchens, laundry rooms, bathrooms and dining rooms—places where you're more likely to use toasters, irons, hair dryers and other big-watt items—are usually served by heavier-duty, 20-amp circuits. 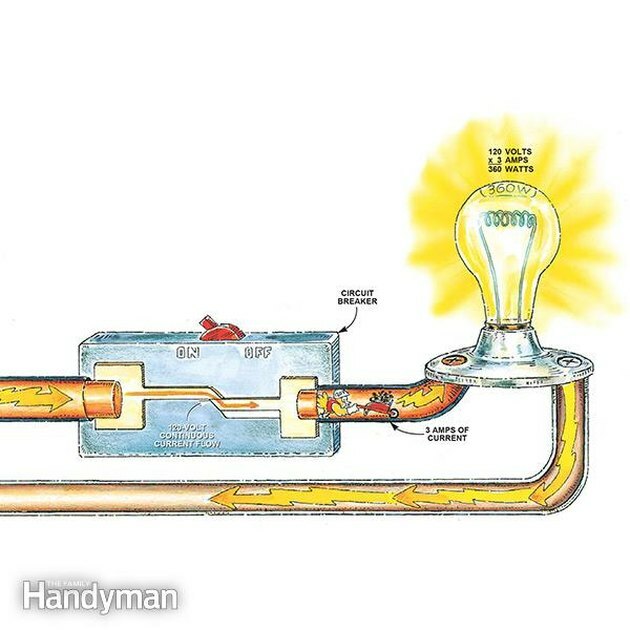 Major appliances like 5,000-watt electric water heaters and 10,000-watt electric ranges demand so much electricity that they take their own 30- to 50-amp dedicated circuit, protected by big, "double pole" breakers. The circuit breaker, the wire and even the wire insulation are all designed to work as a system—and that system has limits. Try to push more current through a circuit than it's designed for and things start happening. Wires heat up under the burden of carrying the excess current. When this happens, the insulation around the wire can degrade or even melt. When insulation melts, current is no longer confined within the wire. That's when fires start. Luckily, the circuit breaker senses the excess current and "trips" to stop the flow of power before damage occurs. The circuit below has too many energy-demanding devices on it and is trying to carry more amperage than it's designed for. Things begin to heat up. Luckily the circuit breaker senses this, trips and "breaks" the circuit. To start solving the problem, we need to know one simple "rule of thumb" formula. This formula will help us determine if all the electrical stuff on a particular circuit is overloading it. This formula also helps define some everyday terms and how they relate to one another. 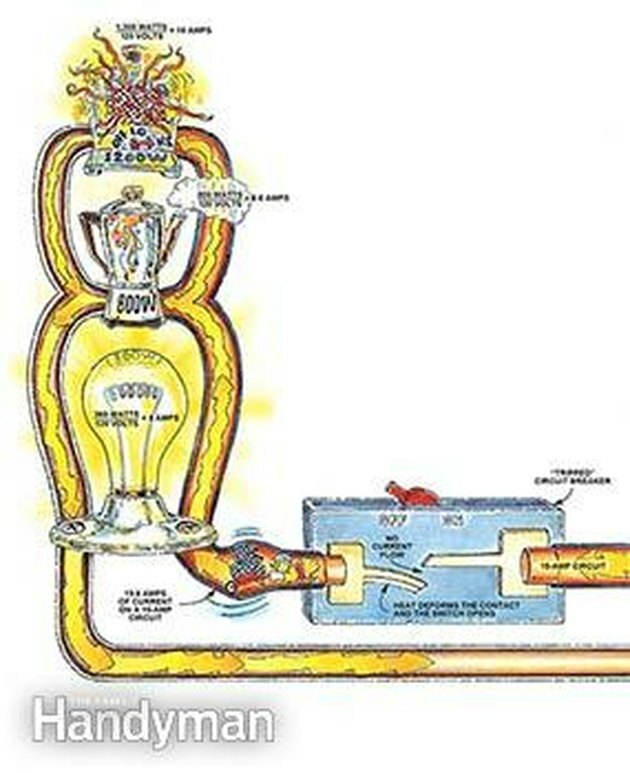 After all, light bulbs and space heaters are labeled in watts; tools and circuit breakers in amps; and our household electrical system in volts: How do they all fit together? Voltage can most simply be described as the pressure under which electricity—a chain of electrons—moves. Most household current is pushed at 120 volts, though current to large electrical appliances is pushed at the higher pressure of 240 volts. Amps (or amperes) is a measurement of the number of electrons the voltage pushes past a given point in one second. Watts is a unit of measurement for electrical power. It indicates how many electrons were pushed through an electric gadget to make it work. It's what the electric company bills you for. Larger appliances, like electric water heaters, dryers and stoves, require so much power that electricity is brought to them via 240-volt circuits. That's because the voltage in 240-volt circuits "pushes" twice as hard. 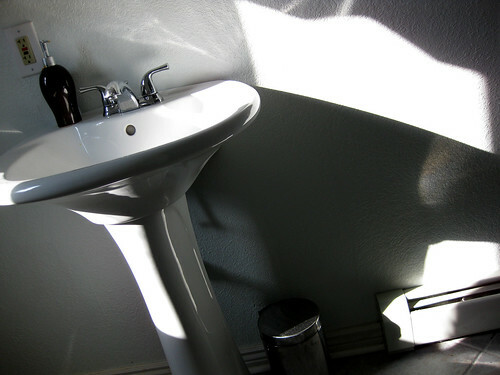 The simple solution is to utilize outlets with excess capacity. You can determine the existing load on a circuit fairly easily: Click off the circuit breaker, then flick on light switches and test outlets to see which ones no longer function. Then add up the total watt load of devices on that circuit. This is often easier said than done. Sometimes a circuit labeled "bedroom" will power outlets in the laundry room. Or the upper and lower outlets of a duplex receptacle will be on different circuits. Once you have a circuit mapped out and the electrical loads added up, you'll be able to tell if you can plug more devices into the circuit without overloading it. As you add up the electrical loads, keep in mind that a wire rated at 15 amps can carry 15 amps all day long. However, 15-amp breakers and fuses can only carry 12 amps—80 percent of their rating—on a continuous basis. Continuous basis is considered to be a circuit loaded to capacity for three hours or more. This 80 percent rule applies to all breakers and fuses. For more in-depth information on calculating loads, see Preventing Electrical Overloads. The best long-term solution is to install a new, dedicated circuits as needed. Most electricians will suggest a dedicated circuit for any appliance that will draw more than half the capacity of a circuit. Anytime you install a large electrical appliance—whether it's 120 or 240 volts—install it on its own dedicated circuit with the correct size wire and circuit breaker. For information on how to wire a new circuit, see How to Connect a New Circuit.